Nigel Wray is a highly successful entrepreneur, and has been a shareholder in several companies amongst others, Domino's Pizza, Carlton Communications and Singer & Friedlander. He also has a strong commercial background built in a range of business sectors. Saracens does a lot of excellent work in its local, north London community. Nigel still calls the area home, too - having attended Mill Hill School, he now lives in Totteridge. The Aviva Premiership rugby club, based in Hendon, engages with some 70,000 local children every year through the Saracens Sport Foundation. The Foundation encourages sport and education, health and wellbeing and inclusion. 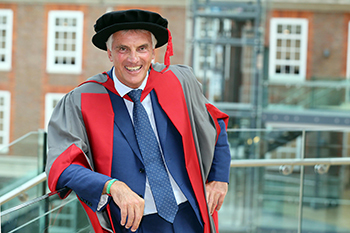 On receiving the honorary degree, Nigel Wray said: "It's humbling to be recognised for this award. Saracens and Middlesex are working closely together to support sport and education in our local community." He continued: "My advice to new graduates would be to live your own life, not that of someone else. Make sure that you do something you have a passion for and not just go for money. "Passion and people create everything, money may follow - it doesn't lead." Middlesex University Vice-Chancellor Professor Michael Driscoll said: "Nigel is a shining example of someone who has used his skills, passion and experience to make a huge difference both in business and to the local community. We're delighted to be able to honour him in this way."